Birds have captivated us for time eternal, not only because of their ability to fly, but also because of the color they add to our lives. Ok, let me be clear that I’m not suggesting that ALL birds are colorful. Birds like Plain Chachalacas and Grey Catbirds hardly evoke images of stunning beauty. But a vast number of species DO exhibit dazzling displays of color. And these displays are not always what they might seem. Have you ever wondered why grackles look iridescent blue in good light and black in bad light? Or why the colorful gorgets of male hummingbirds appear and then disappear without warning? This is because color in birds is not a simple thing. But rather it is a complex concoction of some very specific recipes. There are two main ingredients that are essential in the making of color. The first is pigment and the second is keratin. And the ways in which these two fundamental ingredients are added to the color cooking pot are what produces the final colors that we see. Pigments are relatively simple color makers. There are three main pigments that give feathers their colors. The first pigment is called melanin and it produces black or dark brown coloration. Melanin is also very strong and is thus often reserved for the flight feathers. White feathers are caused by a lack of pigmentation and are much weaker than black feathers due to the lack of melanin. This might explain why many predominantly-white bird species have entirely black or black-tipped feathers in their wings. These feathers are exposed to the greatest wear and are required to be stronger than regular feathers. 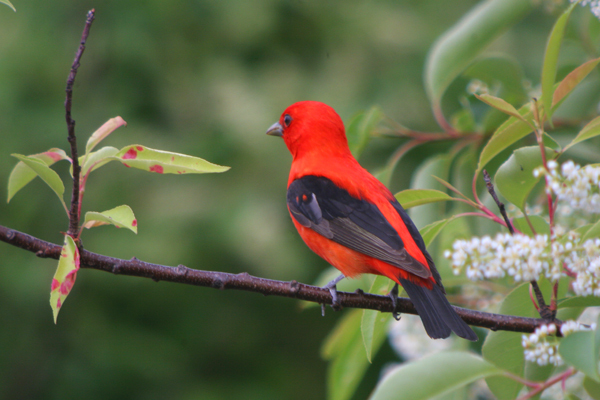 The second group of pigments are called carotenoids and they produce red, orange or yellow feathers. Carotenoids are produced by plants. When birds ingest either plant matter or something that has eaten a plant, they also ingest the carotenoids that produce the colors in their feathers. The pink color of flamingoes, for example, is derived from carotenoids found in the crustaceans and algae that the birds sieve from the water. The third group of pigments are called porphyrins and these are essentially modified amino acids. Porphyrins can produce red, brown, pink and green colors. This pigment group is the rarest of the three pigment groups and is found in only a handful of bird families. The best-known example of porphyrins is the red pigment (often called turacin) that is found in many turaco species and turacoverdin, the green pigment found in many of the same turaco species. Mixtures of pigments can also produce different and unusual color hues and shades. For example, the dull olive-green colors of certain forest birds is actually a mixture of yellow carotenoid pigments and dark-brown melanin pigments. Then we get to the second main ingredient that produces color: keratin. Keratin is the tough protein of which feathers are made. It also covers birds’ bills, feet and legs. Keratin is responsible for the iridescent coloring of many spectacular bird species. How keratin produces color is a rather complex process but, from what I’ve read on the subject, I shall attempt to simplify it as follows. Keratin produces color in two main ways: by layering and by scattering. Layering colors are produced when translucent keratin reflects short wave-lengths of colors like blues, violets, purples and greens. The other colors are absorbed by an underlying melanin (black) layer. The ways in which the keratin of the feathers are layered will dictate the color of the iridescence. Examples of layered coloring include the iridescence of glossy starlings and the speculums or wing patches of many duck species. Scattering is produced when the keratin of feathers is interspersed with tiny air pockets within the structure of the feathers themselves. 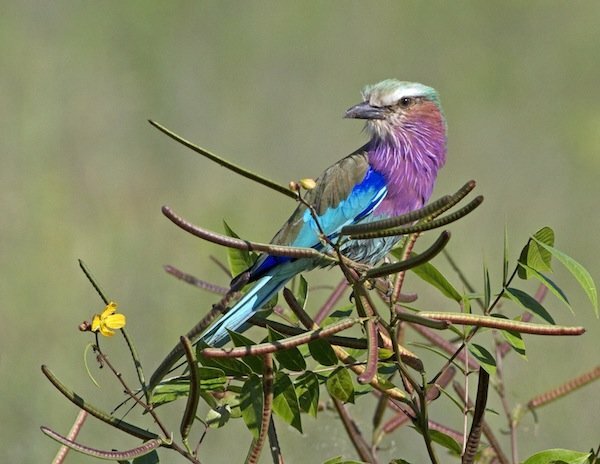 These air pockets and the interspersed keratin scatter blue and green light and produce the shimmering colors of birds like kingfishers, rollers and bee-eaters. 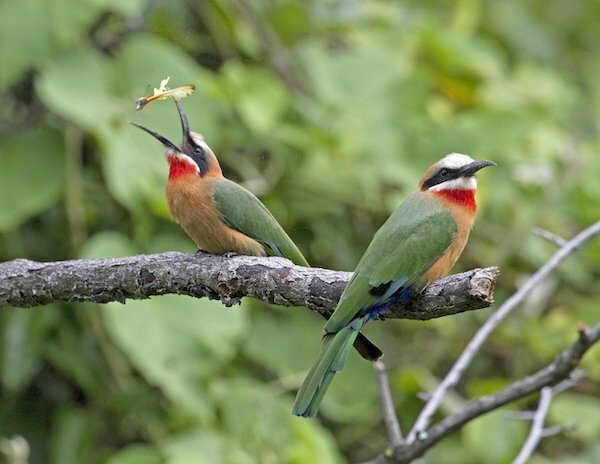 The magnificence of some of these scattered colors is wonderfully exhibited in Adam Riley’s post on the “Bee-eaters of Africa”. And like any really good dish, there are times when several ingredients need to be mixed together to produce a really good recipe. And both keratin and pigments can be combined to produce certain colors. The greens of many parrot species are caused by blue scattered light (produced by keratin) interacting with yellow carotenoids (produced by pigments in the feathers). Grey feathers are produced by the combination of scattered white light and melanin pigments. Learning a little about how color is produced in birds now presents me with an entirely new birding challenge when out in the field: figuring out the various color recipes that birds employ to dazzle! Thank you for a very concise explanation. I thoroughly enjoyed it. You deserve a pat on the back. i rescued a summer tanager 4 1/2 years ago..she (we call her she, but it is probably a he) was brought to us naked and helpless and we hand fed her and tried to set her free, but she did not want to leave us..she changed from green and yellow to pink, but in all these years has not attained the really red color and green still sometimes shows through..do you think she is pink because she is housebound? @karen: I would say that more than likely this would be the cause. She is probably missing something from her natural diet. Fascinating post and gorgeous photos. Thanks so much!! This is such a well done article. Very informative, very interesting. Thanks! I live in south Texas and at any given day we can see 10-15 different species in our back yard. My husband is good at putting out the proper types of feed and feeders as well as a birdbath for water and cooling down. I just read your article on coloring-came to your site to solve a bet I made with my spouse- I thought feathers did not contain color per se, but elements that when combined w/sunlight gave the illusion of color. I am guessing I lost this bet now. Still it was nice to find your site. We have a pair of red-headed woodpeckers that I see daily from my kitchen window, numerous pairs of emerald humming birds, chickadees. Tufted titmice, red birds, scrub jays, blue jays, sparrows, Martins, a tiny bright yellow bird with a black cap, and an owl that we can hear at night but never seen. We also have dove pairs and an occasional red-tailed hawk which of course drives the other birds away til he leaves, plus many others. We are not professional birders but feel very blessed to have these sweet creatures and their songs living with us year round. Thanks for the site and for what you do for our wildlife. Did I lose the bet? Can you explain the white of Egrets? Thank you for your very imformative article about colors of birds. 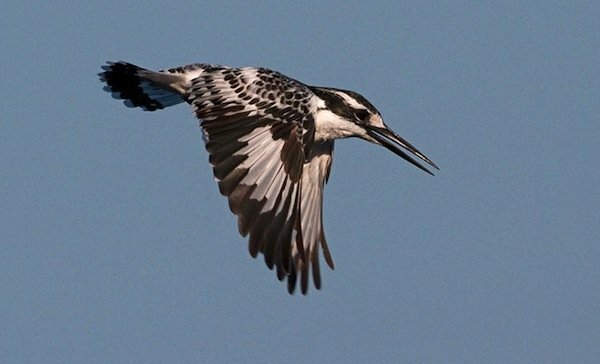 Where Are You Birding This Third Weekend of December 2012?